Populism – on both the left and right – has recently become a powerful force in western politics. This column uses individual data on political attitudes to argue that economic drivers are the most important factors influencing the demand for, and supply of, populist parties. Recent data also show that as these parties gain support, their political rivals adapt to embrace populism. The unexpected successful spread of populism in Western countries has triggered enormous interest in the phenomenon (e.g. Dustmann et al. 2017). In the last year, the number of searches for the word “populism” documented on Google Trends has increased by a factor of five, compared to its average in 2012-2015. The big question we are facing is: “Why now, in so many places, at the same time?” In this column, we argue that the key reason for the unprecedented wave of populism on both sides of the Atlantic is economic. The situation in Western countries over the last decade can be described as a global crisis that affected both markets and sovereign states simultaneously, leaving people without a safety net. This had not been the case in the past: the crisis in the 1970s was mainly a market crisis, while the various crises in the 1990s were government crises, in times when markets were thriving. The rare combination of markets’ and governments’ inability to guarantee economic security has shaken the confidence in traditional political parties and institutions, facilitating an increase in fear, aggravated by other threats such as mass migration. In a recent paper, we document how this global dual crisis affects the demand and supply of populism systematically, and argue that a key to understanding both the demand and supply of populism is the effect of economic insecurity on voter turnout (Guiso et al. 2017). Several studies have addressed the issue of populism recently. Algan et al. (2017) study the political consequences of the Great Recession in Europe, documenting that in post-2008 elections, EU regions experiencing higher unemployment gave more support to populists. They also document that regions where unemployment rose experienced the sharpest decline in trust in institutions and traditional politics. Dustman et al. (2017) report similar results, showing that in the aftermath of the crisis, mistrust towards European institutions – largely explained by worse economic conditions in Eurozone countries – is positively correlated with populist voting. Foster and Frieden (2017) nuance this result using individual characteristics from the Eurobarometer survey data, and also show how the link between mistrust and populism is more pronounced in debtor countries. Inglehart and Norris (2016) observe that cultural variables affect the decision to vote for a populist party (instead of abstaining or voting for a non-populist party) more than economic variables. But their finding of a weak direct effect of economic variables is due to the fact that they fail to observe that economic security shocks significantly affect the incentive to abstain, which is instead the key intermediate channel that we emphasise in our research. Beside the fact that these studies do not consider the crucial role of the incentive to abstain from voting, the other distinguishing feature of our work is the balanced effort to understand both demand and supply of populism, rather than focusing exclusively on the demand side. Rodrik (2017) is the only recent paper that focuses on the supply side. He traces the origin of today’s populism (mainly, if not uniquely) back to the globalisation shock, arguing that past history as well as economic theory imply that waves of globalisation can predictably lead to a populist backlash with a specific timing (when the shock hits) and geographical pattern (in countries that are most adversely affected by globalisation). While the globalisation shock generates a demand for populist policies, Rodrik stresses the importance of simultaneously understanding the supply side of the rise in populism – specifically, the chosen orientation of populist parties, which he argues reflects the relative salience of specific cleavages induced by the globalisation shock. Our research establishes that the abstention disillusionment effects, neglected in the literature, make economic insecurity appear to be the real driver of populism on the demand side. Moreover, the same disappointment/abstention effects determine the timing and quantity of populists on the supply side. they promote policies offering what we call short term protection, with no regard to the long-term consequences for the country. We take these three elements as defining features of populism. Clearly, they support each other. For example, if a non-populist politician counters a populist policy proposal stressing its future costs, the populist challenger might claim that this concern is actually driven by the self-interest of the elite. People’s disappointment with the elite lends credibility to the claim. What has been making this type of strategy successful across the Atlantic, determining a demand for populism? Is it a global shift in voters’ preferences, which is then captured by new political leaders who enter politics? What are the main drivers of the supply of populism? We address these questions, drawing on our research on the spread of populism in Europe (Guiso et al. 2017). Conditional on already having a populist party as part of their menu of choices in a country, voters should always be thought of as having two choices: whether to go to the polls or not, and which party to vote for conditional on turnout. Voting intentions only matter for those voters who choose to participate in the election. If participation decisions are driven by some of the variables that also influence the choice of party, then in order to draw a correct inference about the role of such variables we need to consider jointly the decision to vote for a particular party and the decision to vote at all. It is well documented (see, among others, the comprehensive work of Blais 2000) that incentives to turn out depend positively on income and age, on trust in the political system, and on education; they depend negatively on the perceived unsustainability of new policies. These variables also influence, with the opposite sign, the choice to vote for a populist party. Therefore, the populist vote preference is positively correlated with abstention. This is important, as it mitigates the populist voting potential. Before describing how we study the demand for populism given the above methodological concern, a word about the data. Our main source of individual level data is the European Social Survey (ESS), mapping the attitudes, beliefs, and voting behaviour patterns of European citizens. Regarding the supply side of populism, we complement the ESS data with several other datasets, such as the World Bank Database of Political Institutions and the World Bank WITS statistics (UN Comtrade). More importantly, we use the five waves (1999, 2002, 2006, 2010 and 2014) of the Chapel Hill Expert Survey (CHES) to study whether populism, once it appears, spills over to other non-populist parties. To account for the fact that the choice of party only applies to voters who participate in the election, itself a choice variable, we simultaneously estimate the decision of the voter to participate in the election as well as his/her party choice if he/she decides to go to the polls. We use a two-step Heckman probit model. Our first step is to measure economic insecurity. We capture this with three measures. Third, an indicator of exposure to globalisation, exploiting information in the ESS on the type of employment, industry and workers’ skill level. We then summarise these three objective measures of financial and economic distress in a single index of economic insecurity by taking the first principal component, rescaled so that it varies between 0 (lowest insecurity) and 1 (highest insecurity). With this measure we are agnostic about the specific factor causing economic insecurity. It clearly captures exposure to globalisation (as emphasised by Rodrik 2017, Colantone and Stanig 2017, and Autor et al. 2017), but also other forces that may have been at work, including obsolescence of labour-specific skills, labour displacement caused by rapid automation (Acemoglu and Restrepo 2017), or enduring disruptions in personal savings and income-generating capacity caused by the financial crisis. The important point to stress is that one single measure is unlikely to capture well voters’ economic insecurity. For example, using unemployment alone would not be enough to explain the rising populist vote in Germany, where unemployment is both low (below 4% as of September 2017) and declining (since 2010). Economic insecurity is our key determinant of the demand for populism. Differently from the papers in this literature that ignore turnout, we can see the mechanism through which economic insecurity works. Economic insecurity acts on two margins: it discourages participation, and it increases the chance of voting for a populist party among those who decide to exert their right to vote. The effect on the participation margin is precisely estimated and large. It is this margin that, in our interpretation, creates the basis for the appearance of populist platforms. For an individual who transits from no economic insecurity to economic insecurity, the probability of voting for a populist party increases by 14.5% of the unconditional sample mean and lowers the probability of showing up at the polls by as much as 21 percentage points (equivalent to 27% of the sample mean). These are substantial effects. We also document that participation in voting and voting for a populist party are also affected by two ‘cultural’ variables: trust in political parties, and people’s adverse attitudes towards immigrants. People with greater confidence in political parties are more likely to participate in elections and to vote for a non-populist party. Trust in political parties is expressed on a scale between 0 and 10; a drop of 5 points on this scale increases the probability of voting for a populist party by 7.7% of the sample mean. The effect of trust in political parties on participation is of a similar strength: a drop in trust by 5 percentage points lowers the chance of participation in elections by 8.8 percentage points, almost 11% of the unconditional mean electoral turnout. Those with more adverse attitudes towards immigrants are less likely to participate in elections and more likely to vote for a populist party if they do decide to participate. But these variables are themselves driven by economic insecurity. Using (pseudo) panel data, we show that people who experience an increase in economic insecurity lose faith in political parties and develop more adverse attitudes towards immigrants (see Figure 1). Hence, economic insecurity drives people’s turnout and voting decisions both directly and indirectly because it leads people to change their beliefs and attitudes. There is a cultural channel in people voting for populism and in people abstaining, but not a cultural cause – the cause is economic insecurity, which also shifts beliefs and attitudes. Trust and attitudes towards immigrants are only proximate causes, not deep drivers of consensus to populist parties. 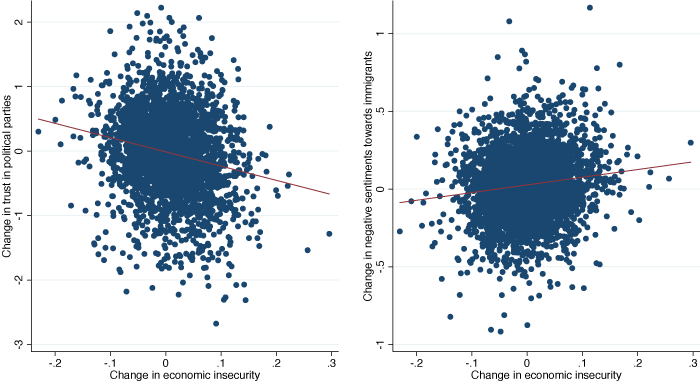 Notes: The figure shows scatterplots and linear regressions of the change in economic insecurity (x-axis) and the change in trust in political parties (y-axis, left figure) and attitudes against immigrants (y-axis, right figure) in the synthetic cohorts panel. Populist parties are not always present. In the year 2000, less than 70% of the European countries had a populist party; by year 2009 they all had at least one (although in the later years of the sample they had disappeared from some countries). Our conceptual framework suggests that the presence of a populist party in a country is heavily affected by how much potential demand there is for it: if the underlying support is sufficiently large, a populist platform is more likely to emerge. We have documented above that economic insecurity undermines confidence in political parties and creates the political space for a populist platform – i.e. a platform with a strong anti-elite rhetoric and a supply of short-term protection. Economic insecurity should accordingly be the major factor in explaining the presence of populist parties. A populist party should emerge if the scale of electors’ disappointment caused by insecurity exceeds the cost of setting up a party, which depends on context-specific variables. We document that the presence of populist parties in the political arena is strongly affected by economic insecurity and discouraged by the presence of relevant non-aligned parties, which weakens the effectiveness of the anti-elite rhetoric and raises the cost of entry. We also show that populist parties choose their orientation by strategically leaning towards the left or the right depending on the relative salience of left-type or right-type cleavages weighted by the share of left-oriented and right-oriented voters. We find that the successful entry of a populist party changes the subsequent electoral competition game and induces traditional parties to adapt their political platforms to those of the populist, lending support to our idea that the disinformation supply and anti-elite rhetoric make it difficult to pursue a contrarian, credible anti-populist campaign. Using different waves of the CHES, we have built a distance between the position of traditional and populist parties on several issues. We find that, in all issues, the distance decreases after populist parties gain consensus – as populist parties gain support, non-populist parties seem to adapt their platforms to reduce the distance from that of the successful populist party. The effects are substantial: increasing the share of votes to the populist party by one standard deviation (16 percentage points) reduces the distance between the non-populist and populist overall platforms by 33% of the sample mean. In conclusion, we provide a unified analysis of the demand and supply sources of the recent populism wave, and as a result we offer strong support for the importance of economic insecurity shocks, with novel findings on the role of turnout on both sides of the political market. The next steps in this area of research will be a methodology to measure and evaluate the effectiveness of the populist rhetoric. What we know so far is that all populists, on both the left and the right, use a similar anti-elite rhetoric with an emphasis on short-term protection, and we now know that the past decade’s crisis pushed voters to switch to the populist supply. But we do not yet know how to disentangle the effectiveness of populist manipulation, and hence how lasting an effect it may have. Acemoglu, D and P Restrepo (2017), “Robots and Jobs: Evidence from US Labor Markets”, NBER working paper no. 23285. Algan, Y, S Guriev, E Papaioannou, and E Passari (2017), “The European Trust Crisis and the Rise of Populism”, Brookings Papers on Economic Activity, Fall. Autor, D, D Dorn, G Hanson and K Majlesi (2017), “A Note on the Effect of Trade Exposure on the 2016 Presidential Elections”, MIT working paper. Blais, A (2000), To vote or not to vote? The merits and limits of rational choice theory, University of Pittsburgh Press. Colantone, I and P Stanig (2016), “Global Competition and Brexit”, Bocconi University, working paper 2016-44. Dustmann, C, B Eichengreen, S Otten, A Sapir, G Tabellini, and G Zoega (2017), Europe’s Trust Deficit: Causes and Remedies, CEPR Press. Foster, C and J Frieden (2017), “Crisis of Trust: Socio-economic determinants of Europeans’ confidence in government”, Mimeo, Harvard University. Guiso, L, H Herrera, M Morelli, and T Sonno (2016), “Demand and supply of populism”, CEPR DP 11871. Inglehart, R F (1997), Modernization and Post-modernization: Cultural Economic and Political Change in 43 Societies, Princeton University Press. Rodrik, D (2017), "Populism and the Economics of Globalization”, CEPR DP 12119.